We are thrilled to announce that DOS Network has formed a strategic partnership with Ultrain! In the near future, the two sides will have deep cooperation in the development of global decentralized applications and the reliable input of off-chain data and complex computing capabilities, aiming to prosper blockchain ecosystem and promote the large-scale adoption of decentralized applications. Ultrain is a leading global technology company that implements trust computing, providing trusted, secure, efficient and cost-effective distributed computing services to businesses and individuals. Comparing to other traditional public blockchain platforms, the core difference of Ultrain is the innovative consensus mechanism (R-POS), which can solve the performance and scalability issues of the blockchain. This consensus can reach 3000 TPS and the confirmation time is 10 seconds. The reason why such a strong consensus mechanism can be created is that the core technical members of the Ultrain team are from Alibaba, Ant Financial, Huawei and other famous enterprises. They have a world-class background of IT, cryptography, peer-to-peer communication technology, and computer security. Ultrain is a global leader in trust computing technology infrastructure, it solved the traditional bottlenecks in blockchain industry, such as low commercial TPS, high maintenance cost and lack of privacy protection. 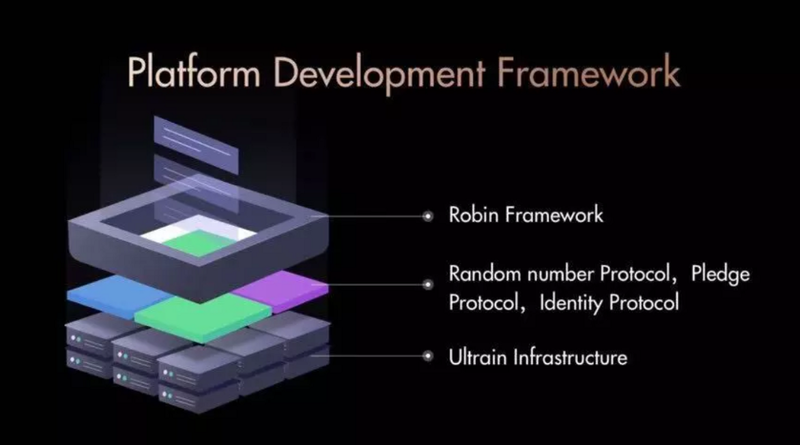 Ultrain is the highest performance 3.0 blockchain project and is the only public chain that could provide commercial service. It has been selected into the Microsoft Accelerator program and Amazon “AWS Activate China” program. 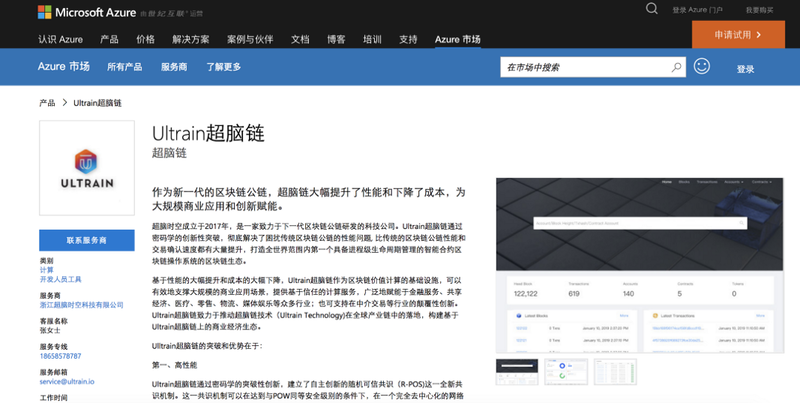 Meanwhile, Ultrain’s commercial trusted computing service has been successfully launched on Microsoft Azure Marketplace. Ultrain is committed to using a distributed, open trusted computing features such as transparency, autonomy, non-modifiable information, based on the internet, through technical means to help business upgrade to transform traditional business model, deep integration of online and offline services and experience to build a new business environment, reducing the participation cost. Ultrain launched the commercial mainnet on January 1, 2019, officially providing commercial services of the public chain. The commercial mainnet has officially opened for mining. The first batch of mining rigs was sold out on the first day of the open sale and the second batch has also been hotly ordered from March 15. Up to now, Ultrain has partnered with leading companies such as YOHO! and Electronic Souls, and launched landing business practices in many industries, such as commerce, games, energy, advertising, medical, charity and so on. DOS NETWORK was founded by Hua Siyuan and Wang Qi, graduates of electrical and computer engineering major from Carnegie Mellon University and early blockchain researcher and engineer. DOS NETWORK is a scalable layer-2 network that implements decentralized oracle services, aiming to provide real-world data and computing power for mainstream blockchains. It links blockchain smart contracts with real-world data and events, and provides verifiable computing power for blockchains, enabling more application scenarios to be implemented on blockchains. 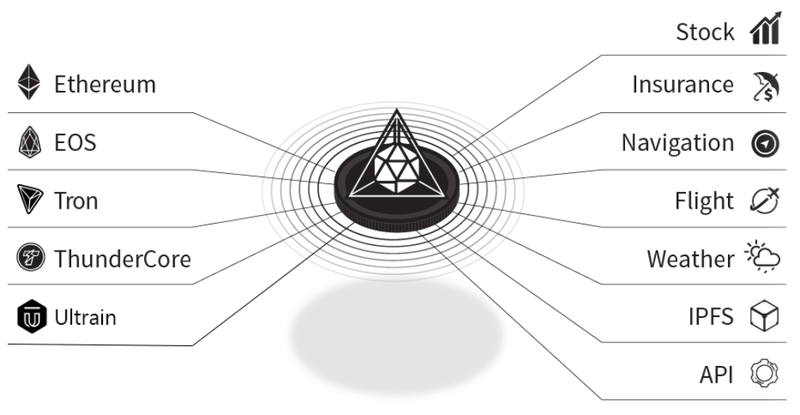 DOS Network can support a variety of mainstream blockchains, such as Ethereum, EOS, TRON, Ultrain and etc. Through DOS Network, these public chains can obtain real-world stocks, weather, flights, and other information. Crypto Incentivized: Dynamic network incentivized by honest participation rewards. Ultrain has established 16 international community hubs and poses a strong presence online around the world. Moreover, it is in the process of building a global community that connects international + local, online + offline, technology + application communities, representing a development pattern for Ultrain’s globalized community. With compatibility to Ultrain, DOS Network can attract users in Ultrain community to use DOS oracle services and even join our network as node operators, which will significantly enrich and prosper DOS ecosystem. With DOS Network’s support, the developers and applications on Ultrain will be able to utilize real-world data and computation power to satisfy their business logic and requirements. DOS Network can feed a considerable amount of real-world data to Ultrain in a timely, secure and reliable manner to help Ultrain become a globally representative public. The cooperation of Ultrain’s strong enterprise resources and DOS’s oracles becomes a “super combination” and both sides will work together to achieve more adoption of blockchain applications. DOS Network builds a secure and trusted data channel for decentralized applications, connecting blockchain smart contracts with real-world data and events, and providing verifiable computing power for blockchains. It enables Dapps to fetch external data and execute complex computation through the decentralized off-chain network in a secure and efficient way, which will encourage more and more use cases to appear on the blockchain. DOS Network and Ultrain will work closely together to provide more application cases for each other while boosting the development of decentralized applications, enabling them to fully take advantage of Ultrain’s innovative consensus mechanism (R-POS) and DOS Network’s fully functional decentralized oracle services. The partnership between the two sides will jointly prosper the blockchain community, providing services for the global blockchain ecosystem and promoting the ecological development of blockchain and the large-scale popularization of decentralized applications.